The concept for Burn Rate began as an idea by Rich Koehler, a software engineer, while he was working at a Seattle-area dot-com. Online magazines like the Red Herring and ZDNet trumpeted each new startup as revolutionary, while he wondered how their ideas could ever work as real businesses. Sure enough, local startups like MyLackey.com and FreePC were unable to prosper on hype alone. The industry crashed in the same way it boomed: frantically and with incredible vanity. A subject as absurd as the dot-com era was bound to produce a great game. As the industry declined, he survived two rounds of layoffs until he was finally let go in a third, in October of 2001. Now with plenty of time, he joined up with Jim Massey, a friend and designer, and they created Cool Studio with the intent of making great games and gifts. 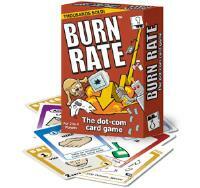 They worked to produce a Burn Rat card game prototype, and tested it in local coffeeshops. It proved very popular with game aficionados and dot-com veterans alike, so they enthusiastically ran with it.